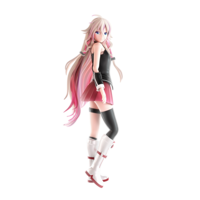 IA is the virtual artist who has a voice with the VOCALOID 3 library (IA -ARIA ON THE PLANETES and IA ROCKS) and with CeVIO library (IA English). Since she was born as a virtual artist in 2012, she has been collaborating with various artists such as Teddy Lloyd and Jin on projects such as the Kagerou Project. Her first live concert in North America was in July 2015, at the Los Angeles Anime Expo, in front of a sold out crowd of two thousand. Considering that this was her first live, it was a spectacular success! In September of the same year, her first solo live “IA – 1st Live Concert in Japan, PARTY A GO-GO “ was held at the Akasaka Blitz in Tokyo. This concert was also resounding success and as a result, she ended up holding a successful world tour in cities such as New York, London, Shanghai, Hong Kong, Mexico City, San Jose, Costa Rica, Melbourne, Montreal, Santiago, Chile, and Madrid. In addition, her film concerts were featured in more than 100 cities around the world, drawing an audience of over 30,000.